Green Baby Bargains: Ringley Ball-57% Off! Only $8.25! 59% off! Start shopping HERE! 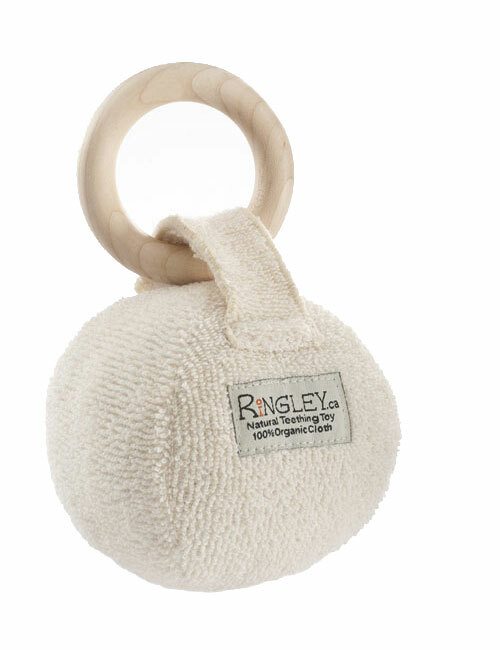 From the best-selling RiNGLEY comes the RiNGLEY Ball! The same natural, untreated Canadian maple ring, but now with a soft, jingly ball or heart attached. Covered in undyed certified organic cotton terry cloth, with a detachable velcro strap so your wee one can roll the ball off the ring or take the heart off, and to make it easy to toss in the washing machine! Use as a teether or a toy. Made free from dye and without harmful chemicals. RiNGLEY provides babies and toddlers with two safe and efficient textures that enable children to satisfy their teething needs naturally. The RiNGLEY original received the 2008 PTPA Award and the 2008 Green Award. Meets ASTM toy safety standards.